Not a member yet? Sign up today and get a 10% discount on your first purchase! Sign up now and get 10% discount on your first purchase! Important Note. An email will be sent to you to confirm reset password. Subscibe to our Newsletter and get the latest news and offers from UnikaBorneo! Welcome to unika borneo online store. 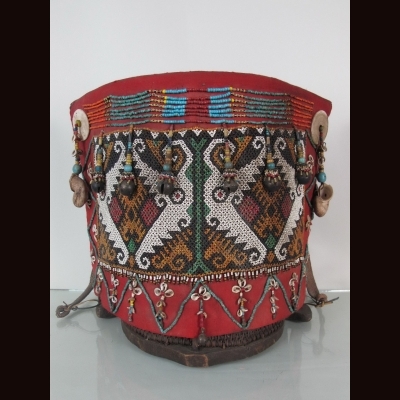 Unika borneo specializes in museum quality borneo dayak arts, indonesian arts, tribal native arts, artifacts, antiques, craft and unique collectables. Our collection has been build over 25 years of experience. Our collection consists of pieces from around south east asia especially in borneo, kalimantan, sulawesi, java, sumatera, nias, sumba, timor, bali, flores, iran jaya, papua new guinea and maluku. Be a member now and get 10% off your first purchase or subscribe to our newsletter for latest updates on our collection. Dayak traditionally carry their child in this baby carrier or known as ' Ba ' by the dayak .At first glance, ba' is a practical, beautifully decorated vehicle for carrying children - one of the many unique in the world slings and bands. In reality it is not so. ba' is really a very practical thing, but at the same time, it is truly a work of art, endowed with supernatural properties and plays an important social role. This particular 'Ba' is from east of Borneo from the kayan tribe of the orang ulu .Decorated with very nice antique bead panels with aso motif and adorn with 7 stripes of antique glass beads with bells and shells all around the beaded panels. Copyright © UnikaBorneo.com 2012-2019. All Rights Reserved.